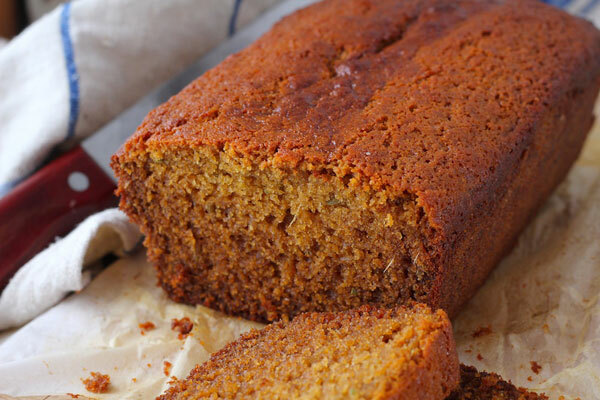 This aromatic gingerbread loaf is exquisite with tea or coffee. 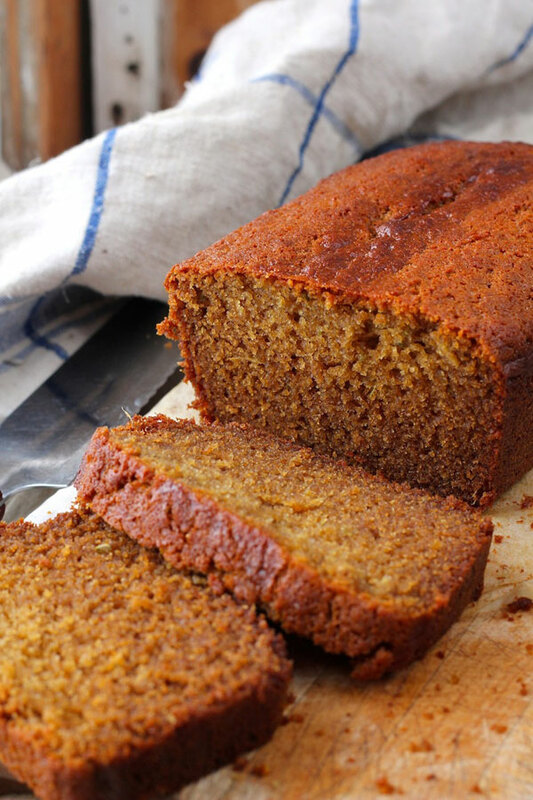 I love to make this recipe because it’s not sweetened with sugar. Instead, it uses only honey to create a moist golden dough that is not overly sweet and has the floral taste of pure honey. When you bake this loaf, the air will be fragrant and anyone in your house will begin to hover close to the kitchen in anticipation of its grand exit from the oven. In this loaf, I use both fresh and dried ginger, crushed toasted fennel seeds, and a couple tablespoonfuls of rum, all of which combine to create a warming spicy flavor. The fennel and rum are optional so if you don’t have them on hand, don’t sweat it, the loaf will be delicious without them. 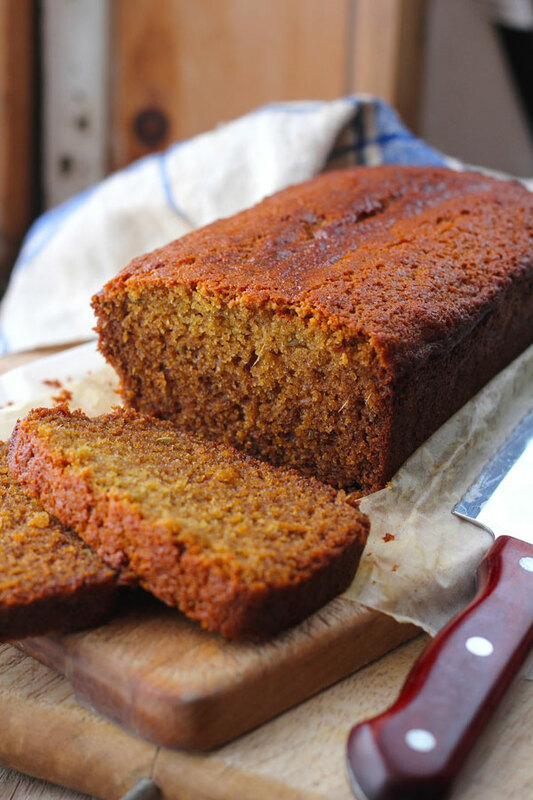 This recipe came about one day when I made an old-fashioned English sticky gingerbread loaf but found the molasses to be too overpowering. As a honey fanatic, I wondered what it would taste like if I did away with the molasses and sugar altogether and used only honey in their place. It was exquisite. If you miss the deep taste of molasses however, you can certainly replace 1/4 cup of the honey in this recipe with molasses. If you’re like me, you’ll need to wrap up this loaf like a precious treasure and hide it from yourself (or others) otherwise you’ll end up eating it for breakfast, lunch, and dinner. Do let me know if you make it in the comments below. Enjoy! Preheat the oven to 325F. Line an 8.5 x 4.5 inch loaf pan with parchment paper. Place the butter and honey in a medium saucepan on low heat until the butter is melted. Remove from heat and add the olive oil, milk, and yoghurt, whisking until mixed. Place aside to cool. In a medium mixing bowl, whisk the flour, ground ginger, baking powder, and baking soda. In a small skillet, toast the fennel seeds for a few minutes over medium-low heat until they begin to smell nice. Transfer them to a mortar and pestle and crush the seeds. 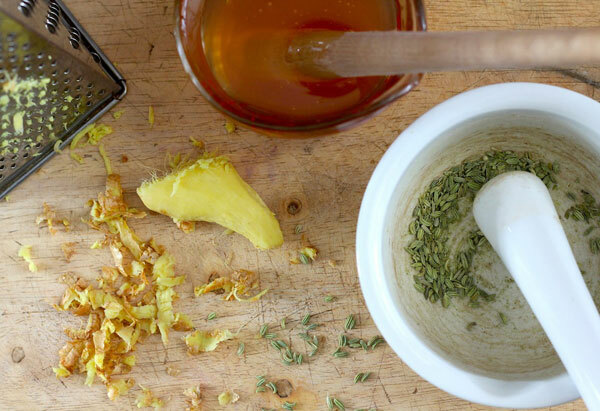 Add the crushed fennel, grated fresh ginger, rum, and candied ginger (if using) to the honey mixture in the saucepan and mix well. Add the eggs to the honey mixture (making sure it isn't hot anymore), beating well. Add about a third of the honey mixture into the dry mix, whisking gently until just incorporated. Add a second increment of honey mixture and mix well. Finally add the third, the batter will be quite light and not very thick. Be sure not to over-mix. 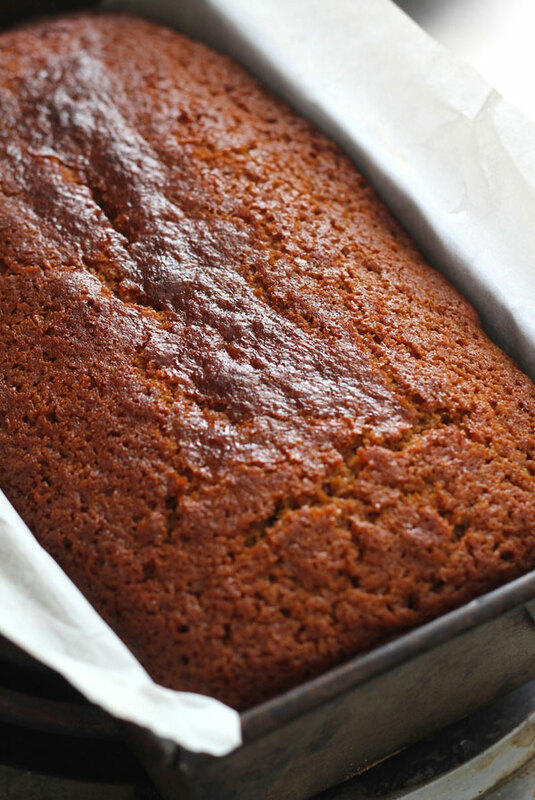 Pour the batter into the parchment paper-lined loaf pan. Bake for about bout 50-60 min in a 325 oven, or until the top is shiny and golden and a knife inserted comes out clean. Allow it to cool in the pan for about 15 minutes. Then remove and let it cool on a rack for at least another 30 minutes before slicing.